An avid paddler himself, YakGear Founder and President Bill Bragman began the company after his inventions for paddle and rod leashes gained attention among friends and family. Pictured is Bragman in 2006, the year he launched the company. HOUSTON – October 24, 2016 – What began as talk around a backroom pool table evolved into YakGear, a full-fledged company serving the paddlesport world. And that company proved it had staying power. On Oct. 11, YakGear celebrated its 10th anniversary in business. Though a well-known developer, manufacturer and distributor today, YakGear started small. 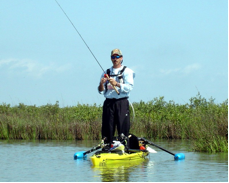 Bill Bragman, who serves as company president, enjoyed tinkering with his own kayak and, ultimately, ways to improve paddlers’ experiences on the water. It was when he developed leashes for paddles and fishing poles that the ball got rolling for business ownership. Bragman opened for business in October 2006, originally under the name Reel Deels. By November of the following year, when the company had grown to offer 20 products, it made its official debut as YakGear. With time came new offerings such as anchors, stabilizers, milk crate solutions and more, all driven to allow paddlers the chance to customize their unique watercrafts and outdoor experiences. YakGear provides the tools paddlers need to take to the water the way they want. 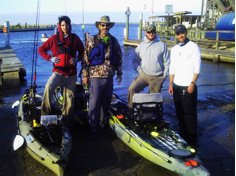 Pictured, from left, are Nathan Norton, Bill Bragman, Kris Henderson and Robert Field during a day of testing products on the water. That do-it-yourself attitude is what watersports are all about, Bragman said. Though the mission remains unchanged, the company itself has grown. Today’s YakGear boasts more than 250 unique products and approximately 16 full-time employees, as well as offerings by RAILBLAZA, Viking Kayaks, Fish Grip and similar brands. The company was also named among the Inc. 5000 Fastest-Growing Private Companies in America for 2016. Bragman described YakGear’s first decade as a memorable and meaningful one. The team learned, made mistakes and grew along the way, but always came out stronger. In addition, the company held true to its roots, making customer service and input a top priority, and proudly serving as paddlers’ KayakRiggingHQ®.